A tiny hawk that appears in a blur of motion—and often disappears in a flurry of feathers. 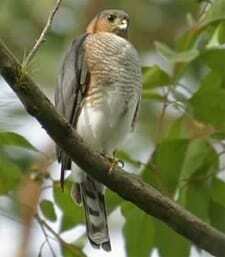 That’s the Sharp-shinned Hawk, the smallest hawk in North America and a daring, acrobatic flier. These raptors have distinctive proportions: long legs, short wings, and very long tails, which they use for navigating their deep-woods homes at top speed in pursuit of songbirds and mice. They’re easiest to spot in fall on their southward migration, or occasionally at winter feeders.